As the consultation process continues to gather momentum, more organizations have presented their position papers to the Constitutional Review Commission (CRC). 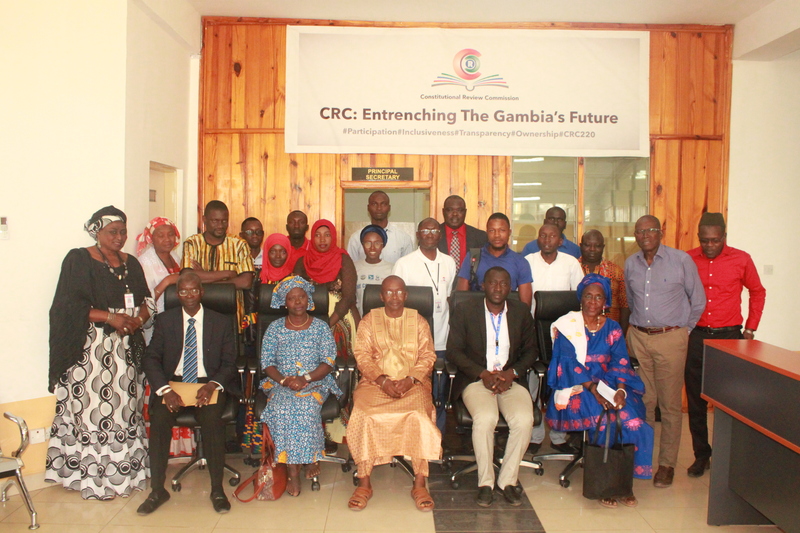 The latest to submit their papers, were the Women’s Bureau, Central Bank of the Gambia, Africans Rising and a youth civil society coalition led by the National Youth Council (NYC), who all made their submissions at the CRC headquarters in Kotu on Thursday, January 03, 2019. 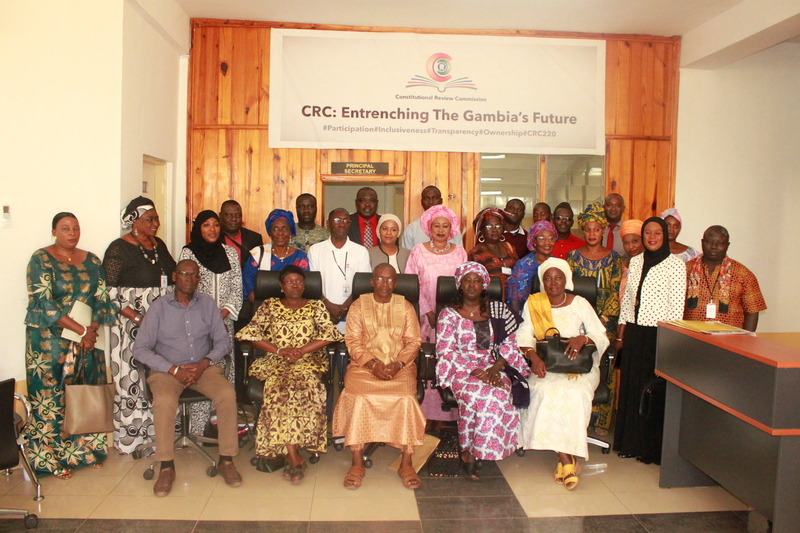 The Chairperson of the Constitutional Review Commission, Justice Cherno Sulayman Jallow, applauded the visiting institutions for their contributions in what he described as a ‘historic process’. “It is a life-time opportunity that we should all seize upon to ensure that not only do we participate in the constitutional review process but that we come up with ideas that will assist in framing the new constitution,” CRC Chairperson said. The Commission, he said, values the contributions from individuals and groups and assured that the documents will be thoroughly looked at. Justice Jallow remarked that national unity and social cohesion are fundamental in the execution of the Commission’s mandate. While noting that not everything can be in the constitution, he was quick to add that all the submissions will be of great significance in the review process. The Executive Director of the National Youth Council, Lamin Darboe, said as part of the drafting of the position paper, they had embarked on a nationwide constituency dialogue and had reached over 10,000 youths whose views are captured in the report. He enumerated other engagements the coalition carried out in their quest to produce a position paper that reflects the views of the young people across the country. Darboe said the process offered them the unique opportunity to participate in the review process and also familiarize themselves with the laws of the country. Among their demands, are the establishment of a presidential term-limit and for the age bracket for presidency to be between 30 and 60 years. Momodou Mboge, Senior Legal Adviser at the Central Bank, said the objects of the Bank are not clearly stated and prioritized in the 1997 Constitution. He added that the Constitution does not provide for domestic price stability which is one of the main objects of central banks. “The central bank should have institutional, operational, financial and administrative independence and in this regard, it should not be subjected to the control or directive of any person or authority and shall perform its functions in accordance with the Constitution or an Act of the National Assembly,” Mboge said. The Executive Director of the Women’s Bureau, Fanta Bai Secka, said the review process offers them the opportunity to make their voices heard. She said the development of The Gambia can only be attainable when women are empowered. She added that their contributions, if considered, will benefit women, children and disadvantaged groups like differently-abled persons. Africans Rising Coordinator, Muhammad Lamin Saidykhan, commended the CRC for priding itself to the principles of transparency and inclusion. He urged the Commission to ensure that their submissions are given merit. Earlier on Monday December 31, 2018, the Gambia Press Union, Independent Response Group and Concerned Citizens also presented their position papers to the Commission.